Ah, but Sandy where are you? Would you believe I'm still in love with you? Would you still think I'm not the one for you? Would you still tell me to find someone new? Recording artist Rafael Brom feature special covers of two Colin Kennedy tunes on Brom's albums entitled Angelophany and All My Love to You Jesus. The two songs are "Sandy" and "LeBuff Goes Undercover" (now entitled "Guardian Angel Prayer"). Release in January 2002 on CD, the album is distributed on Brom's Contact - Mailing Address: COSMOTONE RECORDS label and made available by mail order this Cosmotone web site order page. Using Kennedy's original recordings as a foundation, Brom added vocals and effects to both. Brom also adapted and sang new lyrics from traditional prayer to Gardian Angel on the previously instrumental "LeBuff Goes Undercover", hence the title change to "Guardian Angel Prayer". Brom specializes in Christian and spiritual music and also is a graphic artist. Although neither tune was considered spiritual in origin, Brom has long wished to cover them and felt that they would be appropriate as opening tracks for his Angelophany CD. The entire album have been mastered at Surface To Air Productions. Yesterday, Rafael Brom came in and handed me a copy of his latest album, "Angelophany". I'd known for some time that he was working on the finishing touches on it. 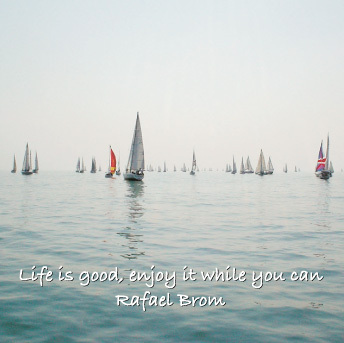 I hadn't heard any new music from Rafael in a couple of years; I figured he was busy with so many other things... I thought his musical career had taken a back seat to all these endeavors. So when he handed me the new CD, I was delighted to see that he was still keeping his hand in the flow of things. I was working on a project that was occupying a lot of my attention at the time, so I thought I would enjoy having some new music going while I worked on this task. I put the CD in my G-4 and started playing it in iTunes, and I was immediately stopped dead in my tracks. I was instantly awakened to a new and beautiful world. A reality and an existence that is the product of someone with a very deep and pure soul. It is very difficult for someone with a worldly and reactionary attitude like I posess most of the time to really understand. But I did understand, from the first note of this wonderful CD. It hit me where I live, full-force. It is the kind of music that you can hear deep in your heart; the kind of music that conquers all human denial, the kind of music that opens the doors to your soul. Rafael caught the spark with this album. It has 12 songs, and it is more than enough to change the life of someone who listens to it with an open channel of spirituality. Aside from the interactive features that this music is full of, it makes a complete spiritual revelatory statement by Rafael Brom. Most eloquently and with great care and attention to detail. I have never experienced a more accurate and multi- dimensional witness of faith than what I hear on "Angelophany" by Rafael Brom. Rafael collaborated with Colin Kennedy of Tortuga Music in Los Angeles on some of the album, and Colin's added touches of professionalism and taste added an extremely polished and sparkling sound to the production. It sounded great in iTunes. It also sounded great on my CD player at home. The songs themselves are like scripts of the future history of planet earth, handed compassionately to us with no strings attached. Just let it sink in. The philosophical and ethical issues are blended into an exotic and flowing series of melodies, chants, beats, poetry and overall wall-of-sound that in its entirety worships God and has a great time doing it. The 12 songs feature an extremely wide array of styles, tempos and songwriting that also caught me by surprize and held my attention to the fascinating structures and layers that come out of each song. I was particularly impressed by the European rock styles represented here that were such a great part of Rafael's life before he escaped from Communist-ruled Yugoslavia in the early seventies. Those sounds invoked images in my mind of his previous life and the environment that he grew up in before he made his run to freedom. Incredibly well done. It's the kind of music I can put on and go about my activities and it's there, shedding considerable light on my life while it plays. I hummed the tunes and whistled along with them and felt a quiet inner peace as the CD played. There are serious, deep moments, humorous songs, some Shakespearian lyrics, pop songs, rock and roll, jazz, Gregorian-influenced chants, baroque-styled refrains, and lots of atmosphere and amazing creative inspiration throughout the whole trip. This is Johnny B, giving a five-star-double-plus rating to "Angelophany" by Rafael Brom. It is not only a "Christian" album, it is one of the best albums I've heard by anybody in any style, ever. I guarantee you, if you're looking for a set of music that you can feel as well as hear, this album is for you. If you're into having some intelligence added to good music that you can tap your foot to, this album is for you. If you're a spiritual traveler, searching for the door handle to the sounds you hear in your soul, this album's for you. I can only say that it impacted my life deeper than I could have ever expected it to. Heck, I just feel lucky to know the guy. This isn't the kind of guy you'd meet every day. And the music that he made here is proof enough of that for me. 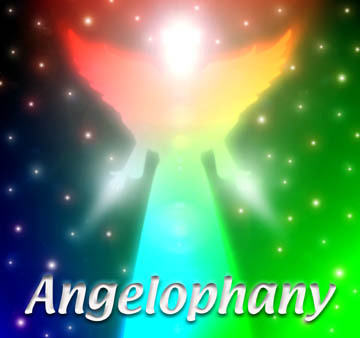 "Angelophany" is truly a once-in-a-lifetime experience. Somehow in his complicated and busy life, Rafael Brom created a genuine masterpiece on the run. Here it is. I sure am glad he stopped by my office with that CD yesterday. Thanks be to God. Love to all.